Chris Mayer is an interesting newsletter guy, a former bank analyst who now writes a newsletter that is typically half looking for undervalued, boring stocks like banks and insurance companies and half looking for far riskier “hidden values” overseas in frontier markets. Or at least, that’s how it appears from the teaser pitches we see for his services. This particular pitch is for his Capital and Crisis newsletter, and it caught the eye of Gumshoe readers because it pitches one of those mysterious, mythical programs that has secret codes and is, of course, never to be known by the great unwashed (that is, unless said unwashed subscribe to Mayer’s letter). “I call them ‘Executive Dividends’ because as you’ll see this hidden strategy—usually only offered to elite exec’s — is the secret behind many of the world’s top traders. “I’m talking about guys like Warren Buffett, Carl Icahn and commodity guru Rick Rule. “While unknown to 99% of the public, these ‘Executive Dividends’ are given out by many of America’s largest and most successful companies — groups like AT&T, Bank of America, General Electric and Goldman Sachs. Who wouldn’t want that, right? He even mentions that Warren Buffett includes these “executive dividends” in every deal he makes, and has set up to receive $2 billion from Goldman Sachs and $260 million from General Electric in recent years, plus an upcoming $5.3 billion from Bank of America. “Although ‘Executive Dividends’ are generally used by elite executives, there’s no legal requirement preventing non-Wall Street types like you and me from cashing in on these ‘executive dividends’ too. He later gets a little bit squishier in his definition of what these “Executive Dividends” are, saying that with “one type of investment within this strategy” you can make money even if the stock goes down, but he doesn’t go into more detail on that. Then he gives a few examples of these “EDP” investments that have recently been successful …. including AIG, which saw 50% returns over six months in 2011 but over 100% returns on the AIG “executive dividends”… or Silver Wheaton, which during a big run from 2009-2011 gained 386%, but had an “executive dividend” that gained over 1,000%… or SunTrust Banks, which gained about 30% over the last year but had an “executive dividend” gain 182%. “You see, while I call these ‘Executive Dividends,’ they are not technically dividends at all. “And although they are issued by individual companies, they are fundamentally different. “While most investors hear the word dividend, they automatically think small and safe returns of 1–2% with large blue chip companies like Coke, J&J and McDonald’s. “The ‘E.D.P’ is not designed for traditional dividend investors interested in slowly increasing gains by 1% or looking to generate small amounts of income. “This is a ‘homerun’ type strategy…. “How much money are we talking about? So … who doesn’t like home runs? So what does the Thinkolator say? These are, as some of you have guessed, warrants. Warrants are a little bit like call options on stocks — they give the holder the right to buy a stock at a set price (the strike price) anytime before the expiration date. Sometimes there are more complexities in the warrant contract, they’re not standardized like options are, but that’s the basic function of a warrant — to give upside leverage on the stock price, they are usually created as inducements in financing deals to boost the potential return for investors. Warrants are very common in the natural resources space, particularly for little mining companies and explorers, but they crop up from time to time in private equity deals, rescue financing, blank check companies and the like. “Maybe you’re wondering how these ‘Executive Dividends’ slash risk. “They’re one of America’s biggest energy companies. And right now, you could buy shares for about $31 and change. “Or… you could buy their ‘Executive Dividend’ for just $1.76. Kinder Morgan (KMI) does have warrants outstanding, a relic of their deal to buy El Paso a couple years ago — the warrants trade at KMI-WT (though tickers vary for warrants — sometimes it will be KMI-WS or KMI.W or KMIWS or any of several different variations), and they give the holder the right to buy a share of KMI at $40 before expiration on May 25, 2017. KMI has been over $40 in the past year and is pretty interest-rate sensitive, but it’s down around $32 now so the warrant is trading for a little less than $2. Like most warrants, it’s pretty illiquid so you can’t count on trading in and out quickly or getting exactly the price you’re hoping for. Mayer does not say that he’s specifically recommending the KMI warrants, to be clear, that’s just one of his examples. Or if you want to really turn Mayer’s rosy risk picture into reality and say that you’re risking “more than 95% less money” then you have to just size the warrant position as if you were buying the stock and keep the rest in something safer — ie, if you would normally buy 500 shares of a $32 stock and risk $16,000, with warrants you can buy 500 warrants and risk just about $1,000 for potential upside exposure to the same number of shares of KMI. (Yes, I know that’s not 95% — the warrants are up a little bit since Mayer pulled his data). So that’s how warrants work — and there is one other key consideration: You have to do something with them. Warrants can and do expire worthless even if they have value — if you hold warrants that are “in the money” (ie, the warrant strike price is below the current price of the stock), they are worth something… but if you don’t sell them or exercise them, they stop existing after expiration and are worth nothing. Your broker won’t generally exercise them for you automatically (the way options are automatically exercised), though they may call you and warn you that the warrant is close to expiry (or they may not), it’s your responsibility to take the initiative to either sell or exercise. But yes, warrants can be an excellent way to get long-term (sometimes very long) leverage on an underlying stock — further out into the future than options are available, and sometimes on stocks that don’t have options trading. And the nine-digit codes he talks about? Well, those actually don’t come up very often with listed warrants like Kinder Morgan or like the others he presumably is talking about, but those are the CUSIP numbers — most of the time you can and would trade warrants using the ticker symbol, so the AIG warrants that Mayer also references as an example would be AIG+ at TD Ameritrade or AIGWS at Fidelity or something similar in most brokerage trading platforms, but you could also call your broker and use the CUSIP if you wanted to be sure (the CUSIP number for that warrant happens to be 026874156). “This latest group of ‘executive dividends’ I’ve found are in the banking sector. “You’ve followed my work at all, you know bank stocks are incredibly cheap right now and offer tremendous value. “But as you may have guessed, I’m not recommending you buy banking stocks. “You see, these ‘executive dividends’ are the result of an anomaly in the market caused by the 2008 crisis and the government bailouts. …and long story short, these could prove incredibly profitable. So these are the warrants that really brought warrants back into the mind of mainstream investors in recent years — the TARP Warrants created by the Troubled Asset Relief Program in 2008, when big banks were threatening to fail in a cascade and the government bailed them out. That bailout came at the price of 10-year warrants for the US Treasury, and as banks started paying back the government the Treasury also sold the warrants on the public markets, listing them on Nasdaq or the NYSE. Some of those warrants represent a pretty impressive value, still, almost all of them are “in the money,” and I own several of them (I hold warrants on JP Morgan Chase, PNC Financial, and Boston Private Financial and have written about them several times for the Irregulars). Which ones specifically are being touted by Mayer? Don’t know. I was at an excellent presentation by Richard Lashley at the Value Investing Congress a few weeks ago and he highlighted Capital One, JP Morgan and PNC as his favorites, all of which are pretty hard to argue with. 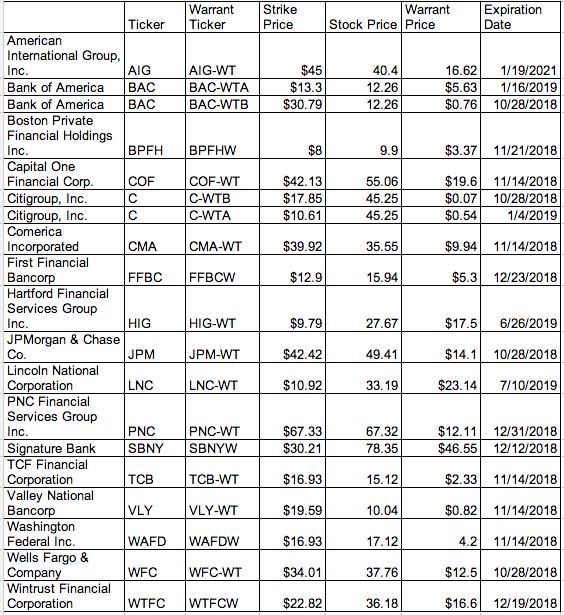 Most arguments for the bank stock warrants like these, which have expiration dates usually in the Fall of 2018, are based on the fact that most of the big banks trade still at historically low multiples of book value and are profitable and growing, albeit slowly, so you could see excellent gains from most of these warrants if the banks just stay the course — and spectacular gains if banks get back to the (probably too high) valuations they carried at their peak of 2X book value or more. Citi note: The Citigroup warrants as noted above are not adjusted for their subsequent 10:1 reverse split. That would change the A warrants to have a $106.10 strike price and, because you’d also need 10 warrants for each share, an effective $5.40 warrant price (as of the dates when these numbers were pulled in mid-April). The B warrants will have a $178.50 strike price and effective 70 cent warrant price. Both are, like the Valley National and BAC B warrants, very, very far out of the money and would require the underlying stocks to more than double before 2018. I still think PNC is the standout in this area — a strong bank at a pretty low valuation, and at these prices (warrant is around $21 now) it has to get to only about $90 in the next four years for the warrant to break even (it’s at $83 now). That’s a simplistic look, not taking into account the dividend, but the time value is low enough that if PNC’s stock price goes up by an average of about 1-2% a year, the warrant breaks even. I think it will do considerably better, but when I was putting a little money to work recently I added a small position in JPM warrants to diversify a little — JP Morgan is larger and cheaper and may have lower downside, but I expect it has less upside potential as well. The Boston Private Financial warrants (BPHFW) are much more volatile and risky, that’s a small private bank and wealth manager and it’s already gotten a pretty nice valuation, I’ve already sold some of that holding but the blue sky potential is much less knowable with them, given their small size, so I’m holding on to the rest to see what happens. Really, though many of the warrants have appealing possibilities — Citibank and Bank of America are arguably the riskiest, because those banks are so troubled, but they also have big possible snapback potential if they trade at a premium to book value again in the future, and the warrants are well out of the money. Wells Fargo, AIG, Capital One and SunTrust are the ones that I consistently hear suggested as possibilities beyond PNC and JP Morgan, but I’ve never owned any of those. The nice feature that the TARP warrants carry, other than their long time to expiration, is that they are protected from dilutive offerings or big dividend raises — normally warrants don’t participate in dividends, and warrant holders are just out of luck if the company decides to dividend out all of its cash instead of reinvesting it to grow the company, but the government wisely forced terms that require the warrant strike prices to adjust for dividends paid out above whatever the dividend was before the TARP rescue. Most banks haven’t gotten their dividends back to that level yet, partly because the Fed is being cautious about approving dividends, but some have, so that will add up over time. Want to sift through warrants on your own? It’s not always all that easy to find them — there’s a pretty good listing of Canadian Warrants freely available here, and the NYSE lets you easily see all of its listed warrants here (about 3/4 of those are TARP warrants), but the other exchanges are not as easy to sift for warrants. There are a couple paid services that aim to find and track all of the outstanding warrants, usually just in the US and Canada, and often provide their own valuation assessment, but I haven’t tried any of them — there’s also a database of outstanding warrants that they say is freely available here, ad supported, though you have to request a free password. For the most part, other than the TARP warrants, you’ll find that they’re usually companies that had to issue warrants in order to get investors to provide financing, which usually means that they are (or were, when the warrants were created) companies of a more speculative nature. Expirations often go out five years or even a bit longer, ten years in the case of TARP warrants, so some of those companies that were startups or rescues or “blank checks” several years ago are coming close to warrant expiration (like Retail Opportunity Investments Corp, which I own and which has warrants that expire this October — we traded the warrants for some nice gains, but I wasn’t willing to hold the warrants as expiration got closer). When you’re within a year or two of expiration, in most cases the warrants and options with similar strike prices and expiration dates should be priced close to each other, and investors are less interested in warrants as they get closer — a lot of the appeal is in the very long time until expiration that gives a nice fertile ground for the investor imagination to conjure up massive gains. Oh, and I should also point out one other key aspect of warrants — unlike options, where each options contract is already attached to a specific share lot that’s in existence when the option contract is written, a warrant creates a new share of stock that the company will issue and sell to warrantholders at the strike price, so the exercise of a large tranche of warrants changes the capital structure of the company. For smaller stocks, in particular, this conjures up worries about dilution — though those smaller stocks are often gold miners and similar resource companies that also do have a great need for the cash that comes in from the warrant expiration. So … got any favorite warrants you’d like to share? Any opinions on Chris Mayer or the TARP Warrants? Let ’em out with a comment below! 33 Comments on "What’s the “Executive Dividend Program?”"
Sorry, will fix that link. There wil always be a buyer at a touch under exercise value, some big player will take a few cents for the quick arbitrage … but the prices can more easily get irrationally high or low and bids may not have huge numbers behind them if you happen to be a larger investor. Liquidity doesn’t bother me that much as a small, long-term individual investor. Do you think its to late to buy the tarp warrants? I bought some JPM-WT and some PNC-WT last week. Unable again to print this without “doubling” print over print. What happened to the old days when one could select print near the bottom of the page and avoid this? Only way I can print without the doubling is to copy all and then print. This works but I get teeny letters and 8 pages of print rather than 16. I think I’ve fixed that, Weaver — thanks for letting us know. Hi Travis, are the Executive Dividends the same principle as Daily Dividends being teased by Angel Publishing Real Income Trader??? I doubt it. I haven’t looked at the “Daily Dividends” but expect those are probably options sales, most likely either covered calls or cash/margin covered put sales, as are most of the strategies passing themselves off as some sort of magical “dividend” plan. This “Executive” one happens to be different because it’s not really about income or regular cash payouts at all, but almost all programs pitching themselves as super-dividends or the like have to do with selling options to boost income. Tanks travis, i will look into this more. you have peaked my interest, Thanks Again for all you do! I have held the AIG warrants since September, 2012. I think this an excellent way to participate in the long term recovery of AIG. Great article, ‘Travis, there some other interesting plays to also consider in the warranty group. Travis,,,,,I entered some of the warrant ticker symbols in the search of my trade king account and it couldnt be located. Is there a specific place I can research and possibly invest in warrants? thanks for the info. I also sent this one into the system and I am glad you cleared this up. I myself do plan on looking into warrants and see if they are right for me. I see they list a strike price. I understood him to sY these are not options. I didn’t have time to read the whole thing. , but did I miss something ? These are warrants, which are similar to call options in some ways (but not standardized, so definitely need to be carefully researched individually). Warrants have a strike price, an expiration date, and, in the case of TARP warrants, adjustments for dividends (over a certain point) or significant dilution. I hadn’t really looked into these before reading this. I just dived into some PNC warrants, I agree with your evaluation of where it’s trading at being a nice juicy spot. I see the premiums shown on these warrants. Other than the fact that these are for periods ranging from four years and up are these similar to options? If leaps for such periods were available what is the advantage to investor from the warrants? Are these easily traded with efficient Bid and Ask differentials supporting decent liquidity? Are these available thru regular brokerage firms ? Travis- You are doing a great job with your analyses. Warrants are effectively long-term call options, similar to LEAPs, except that they trade like stocks. In the last few years of these warrants, they should trade with similar prices to LEAPS with the same strike price. There is one advantage to warrants, which is that they are adjusted for dividends, which options are not, so you benefit both from dividends and price appreciation. I am a bit confused on how to trade these warrants. I have tried both Scottrade and mu optionsfirst account and get no such symbol exists. How does on go about trading in the warrants? Every brokerage uses different tickers for warrants, but they are listed so pretty much any broker should be able to trade them for you. You can try searching on the name of the company to see if one of the tickers is the warrant ticker — I usually find that they’re along the lines of: JPM-WT, JPM.WT, JPM.WS, JPMws, JPMWT or something like that for JP Morgan’s warrants, for example. Haven’t seen that one pitched. Could be Mongolia, he’s been following Mongolia Growth Group for a couple years (I happen to own that one), but I’d need to see more detail. Thanks for making things clearer in a condensed fashion. 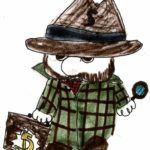 Edited by Chris Mayer, a stock picking newsletter that looks for undervalued and "hidden" stocks. Ceased publishing when Mayer left to write a couple new letters for Bonner & Partners. What five stocks is Chris Mayer putting in his "Coffee Can" portfolio to buy and hold?